The rhubarb (Rheum palmatum) leaves are unfurling, coming out of the magenta nubbins that started poking out of the cold wet soil a few weeks ago. They'll need to be divided next year, to keep them from entirely taking over the area they share with the asparagus and perennial herbs. Not necessarily the best bedfellows, but it's where they are right now and everyone seems to put up with it, so moving them around hasn't been a high priority. 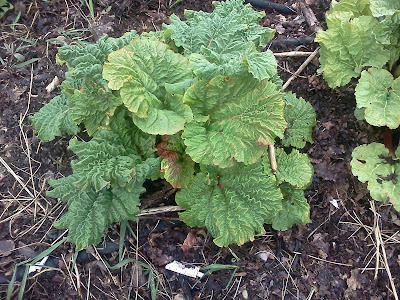 Now is the time to add an inch or so of good compost around the root zone of rhubarb. The roots are huge and look a lot like bright orange sweet potatoes when cut. It takes a lot of stored food to grow those gigantic leaves and a lot of green surface to manufacture enough food to support those big roots! 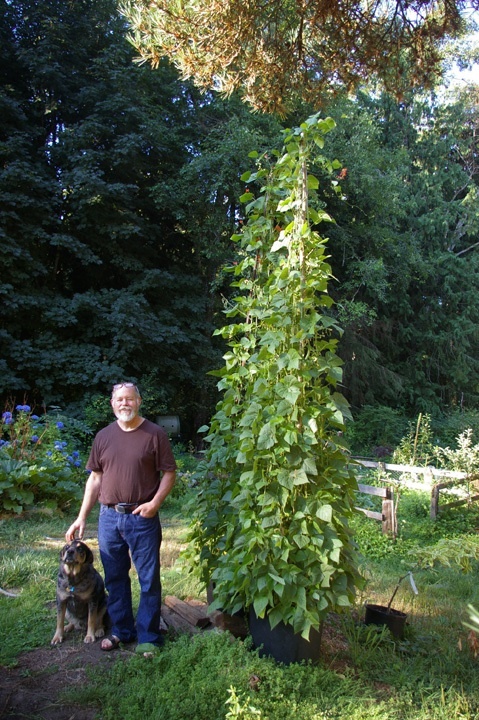 New Vegetable Gardening Classes in Poulsbo Parks & Rec catalog! I have 5 classes offered there and will be particpating in the Summer Pruning class put on by the Poulsbo Tree Board in July. Come join me for a fun afternoon touring a working farm! Learn about soils, year-round growing and equipment to make gardening and small scale farming easier and more efficient. I’ll be giving a talk on starting seeds indoors. Presented by WSU Kitsap Extension Small Farms Team, Pheasant Fields Farm, and Washington Tractor. Saturdays April 14 and 21, 10:00 AM-4:30 PM Organic Vegetable Gardening Learn the basics or hone your gardening skills in this 2 day course. Topics covered include garden planning and design, soil preparation and testing, plant selection, synthetic-free fertilization and pest management, irrigation and harvest tips. Students will start seeds to take home for their own gardens. Bring a sack lunch and your edible gardening questions! Tuesday, April 17, 6-8:30 PM Grow Your Own Salad Bowl! beans in a container, did you? Ahh, my first blog post! I just came in from the garden with an armload of kale, broccoli and carrots. They were all planted last summer for harvest through the winter and early spring. Steamed Purple Sprouting broccoli and freshly pulled carrots for dinner tonight! Not very Irish, but we’ll be celebrating St. Paddy’s tomorrow with a colcannon of the last of 2011’s potatoes and the kale I just picked. Harvesting the last of the over-wintered crops makes room for the new plants in the greenhouse waiting their turn to get into the garden. I’m a little later than usual this year, but the broccoli, cauliflower, Bok Choi and cabbage will be ready in a couple weeks. The tomatoes will be going in under a low tunnel cloche soon after that.